As a church family we have been journeying through the book of Bible known as 1 Corinthians. This book has been challenging us as it raises a number of questions and issues in regards to living as the church and following Jesus. We have largely spent time teaching this book through sermons. However, for at least one Sunday we want to hear from you. What questions do you have? What topics would you like further conversation around? 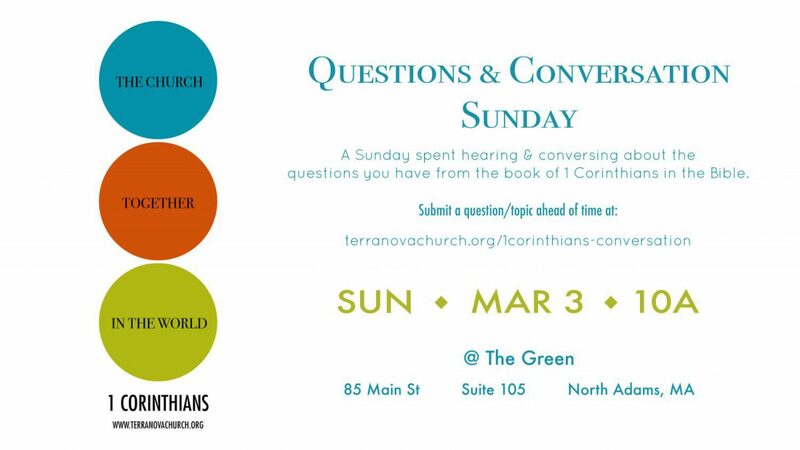 So, on Sunday, March 3rd instead of a normal “sermon” we hope to have an open conversation addressing your questions & thoughts through a panel discussion with a questions & response format. Anyone and their questions are welcome. Please feel free to submit your questions/topics head of time HERE.